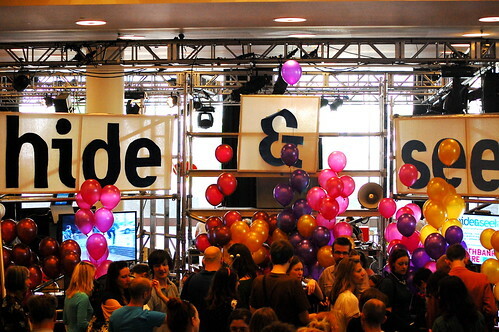 Recurring readers might remember my blog post from last year about the Hide & Seek Festival. It was a great three days of playing pervasive games, meeting like-minded people, and running around like crazy. This year the event is again being held for three days, and it sounds like it’s going to be just as fun. The event will take place in and around the Royal Festival Hall, part of London’s Southbank Centre. They’re starting this evening at 19:00 with a couple of games (with as theme Beyond Werewolf), including Grand Emperor (which I’ve been wanting to play for some time now) and Hermit’s House (Players take the roles of a group of people stuck in a haunted house, and must find creative ways to solve the problems presented to them). Tomorrow and Sunday the games run from 11:00 to 18:00, although if you just want to dip in for some brief gaming, you can drop in (and leave) at any time you want. It’s sounds like as if it’s going to be a fun couple of days, and I’m really interested in going. I’m not too sure about tonight or Sunday yet, but I’m definitely going to make it tomorrow (although 11 might be a bit too early). Check out the complete schedule on the Hide & Seek website, so that you can plan which games you want to participate in (no need to sign up or anything). See you there?